Chalisa - forty verses of lyrics. Verses that praise and plead with devotion. They are recited over and over again or chanted by groups ... even in the cane and rice fields by early indentured laborers ... or sung quietly in private temples in many homes. Each is directed to a deity ... there are as many dieties as their are virtous deeds and acts ... whose acts and deeds are recalled in the verses to aid the devotee to meditate on righteous and noble qualities.Chalisas have been in existence since the emergence of the human race. - Rotating Deity Photos while listening the Ram Chalisa Audio. -For bringing in more clarity of mind, tolerance and strength to withstand obstacles in life. 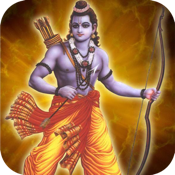 -the chanting of Rama Nama dispels all evil and obstacles of life. It is a way of liberation and salvation of human suffering.